Find more photos of him with fans on the James Barbour official Facebook fan page. I've seen James Barbour perform in Jane Eyre four times from December 2000 to May 2001—his performance (as well as the entire cast) was extraordinary. After one performance, he graciously signed my daughter's playbill. I would love to see him perform again. I wish he would make another recording—I love his voice! I listen to the Jane Eyre recording at least once a week—it brings back wonderful memories of the musical. Thanks James! This summer I attended the Brott Music Festival in Canada with my partner in krime...and so my tale begins. The scene: The desolate streets of Hamilton, Ontario. Noah's Ark had landed and the show drew to a close. My partner in krime and I meandered our way out of the theatre and down a dark side street. The air was crisp, a bit cold for those summer nights. Luckily I had brought my trusty jean jacket. The sidewalks were spraying a cool mist into the air. Pensive yet reserved, I questioned this strange Canadian custom. I then proceeded to frolic in the refreshing spray. At this point I must preface my story with another story. FLASHBACK: A long time ago in a land far, far away, two girls made a video letter to James Barbour. To be concise, the tape included a somewhat serious letter, a few ridiculous reenactments and some hilarious bloopers. However, one of the girls comes off as a bit of a, how you say, "moron," for the sake of comedic affect. This girl is not really that stupid, but you must trust me that she appeared quite ridiculous in the video. After all, who would think that Mr. Barbour would have time to watch this film? It was made for purely shits and giggles, not so much for him. FLASHBACK: My partner, what excellent bantering skills. She was made to banter with this stranger. And so I was introduced...but why did he look at me so strangely? Imagine a look, the kind you might give someone if you think you know them from somewhere. You are pondering...where do I know this person, and why do I get the feeling that there is something mentally unbalanced about them? CAPTURE THAT LOOK. So that's the look he gave me. Then he says, "Wait, are you the two that sent the video...????" This is where we reply, "NO WAY! You saw the video???" JB: "Yes...we ALL watched it in the office...you are pretty funny." At this point my partner proceeds to tell him that I am not truly an idiot...yadda yadda yadda...we say our goodbyes after a few photo ops and some autographing. I shrink away entirely embarrassed...My partner and I return to our trusty patrol car...but ALAS, where are our keys??? Me: "[Expletive deleted]! We can't be locked out in a different country!" So we search around...nothing. Mr. Barbour had stolen my partner's heart, but had he stolen my keys???? Haha WE found them...in the camera bag...blasted if that isn't the last place I always look. Haha so that's the embarassing story "Meghan" [true name censored for privacy] wanted...if that is her real name...did Mr. Barbour and I "have a moment"? A side note from "Meghan": This is indeed the account of our meeting Mr. Barbour. However, I'd like to add how incredibly nice and gracious he was, which my partner in krime left out as a result of our sheer embarrassment. He's a really sweet and down-to-earth guy. Oh, and also, Hershey Felder looks remarkably similar to Balki Bartokomous from the hit series Perfect Strangers. If you've met James or seen him perform, I'd love to add your story to this page! Fan art submissions are also welcome. 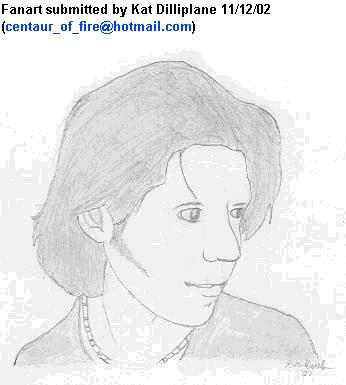 Please send your story or drawing to me at JBarbourFan(at)gmail.com.